In a letter to Katherine Dreier dated February 17, 1942, Valentine Dudensing wrote about closing Piet Mondrian’s first U.S. exhibition. The show, which featured twenty paintings and eight drawings, had opened at the Valentine Gallery on January 19th. Since he arrived in New York sixteen months earlier Mondrian had finished only two paintings. With not enough time to complete more new works, Mondrian reworked and updated eleven existing paintings for the exhibition. Dudensing hung these thirteen paintings in the natural light of his gallery’s front room at 55 East 57th Street. For visitors to be surrounded by the predominantly white paintings with black grid lines syncopated with small blocks of primary colors was awe-inspiring; at least one young artist was struck by the impact of the works. At the time of the show Leland Bell was employed as a security guard at Solomon R. Guggenheim’s Museum of Non-Objective Painting. Within earshot of the museum’s curator, Baroness Hilla Rebay, Bell was overheard telling a museum visitor: “You want to see real painting, go to the Mondrian show at the Valentine Gallery.” The comment cost Bell his job. While Valentine Dudensing is responsible for organizing Mondrian’s first solo exhibition, Katherine Dreier deserves credit as the first to identify the artist’s work for inclusion in an important group exhibition in the U.S. One of the founders of the Société Anonyme, an organization that aimed to be the country’s “first ‘experimental museum’ for contemporary art,” Dreier organized the ambitious International Exhibition of Modern Art that opened in November 1926 at the Brooklyn Museum. She chose to show two of Mondrian’s black and white paintings among the over 300 works in the exhibition. A decade later Valentine Dudensing became Mondrian’s U.S. representative. The artist, who was living in Paris at the time, sent two paintings to the Valentine Gallery in the spring of 1936 just as Cubism and Abstract Art opened at the Museum of Modern Art; Alfred Barr’s groundbreaking exhibition featured nine paintings by the artist. The timing was fortuitous for Dudensing who sold both works and began making arrangements for the artist’s first solo exhibition at the Valentine Gallery. The exhibition was originally scheduled for May 1937 however after being postponed, the show was canceled. With war looming Mondrian left Paris in the fall of 1938 and moved to London until he was finally able to emigrate to the U.S. in October 1940. Once the artist arrived in New York, Dudensing arranged for a fall 1941 show which was then postponed until January 1942. In the interim Mondrian completed two new paintings: New York City and Boogie-Woogie and reworked eleven that he’d made in Paris and London. By adding more and thinner black lines and blocks of primary color, Mondrian gave the paintings what he called “boogie-woogie” — dynamism inspired by jazz music which he loved and his new life in New York, a city in perpetual motion. In an unprecedented move Mondrian added the year of completion to the original date on the canvas face. This “double-dated” group became known as the “Transatlantic Paintings” and was the subject of an important exhibition organized by the Fogg Art Museum, Harvard University Art Museums, Cambridge, Massachusetts, in 2001. In addition to these recent paintings, the Valentine Gallery exhibition included seven early paintings from 1906 (the “Naturalistic Period”) and 1910 (the “Transition Period”) along with eight drawings completed between 1912 and 1914. 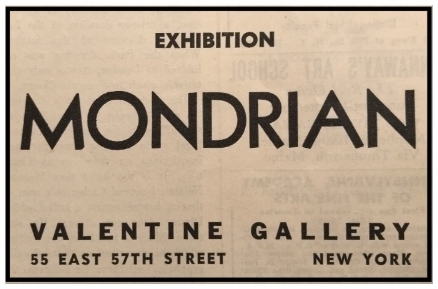 After the success of this show, Dudensing held two more exhibitions of Mondrian’s paintings at the Valentine Gallery. The first opened in March 1943 and featured six works from 1936 to 1943; the second opened in March 1946 — nearly two years after the artist’s death — and included unfinished works from his studio. Below is the checklist of the first Mondrian exhibition in the U.S. with links to images. The identifying numbers are from the catalogue raisonné by Robert P. Welsh and Joop M. Joosten. Links to images not in public collections are courtesy of the Mondrian Edition Project on the website RKD: https://rkd.nl.